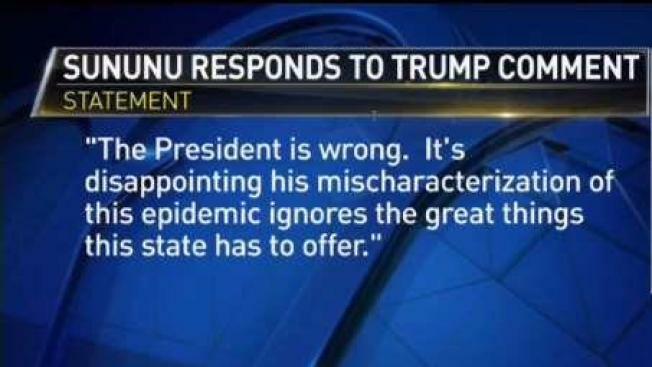 There’s backlash in New Hampshire to comments made by President Donald Trump. The president raised the issue of New Hampshire as he pressed Mexico’s president to pay for his border wall. NBC Boston spoke with people trying to recover from addiction and they say the president’s words are not only judgmental, but incredibly hurtful. After being addicted to opiates for two years, Wallack is trying desperately to rebuild her life, but now she’s convinced even our president is rooting against her. But Trump’s former campaign advisor Al Baldasaro says the state’s 500 fatal overdoses last year alone are proof what the president said was 100 percent true. “We do have a drug problem in New Hampshire and Donald Trump said it like it is,” Baldasaro told NBC Boston Thursday. But Baldasaro says Trump wasn’t insulting the Granite State. He says the President was making it clear – New Hampshire is battling a drug crisis and his promise to fix it likely won him some votes. “He was one of the only candidates speaking about our drug issues and it went right to the heart of the people,” Baldasaro explained. Meanwhile, the state’s all-democratic delegation took to social media to condemn Trump’s statement. President Trump must have been referring to his win in the First in the Nation Primary, because he lost to Hillary Clinton in New Hampshire during the general election. Click here for the full transcripts released by the Washington Post.